As I began to draft this post I was on a train from Providence, Rhode Island to New York having spent the last few days at the 63rd Annual Meeting of the American Research Center in Egypt (ARCE) which ran from Friday 27 – Sunday 29 April, 2012. I had been meaning to attend the Annual Meeting for several years, either to present the results of my doctoral research or to raise awareness of some of the things we had been working on at the EES, but had never found the right opportunity. This year, my first as EES Director, seemed to present the perfect moment to make my debut. ARCE and the EES have many things in common: both are membership organisations with many professional Egyptologist members but most of whose subscribers are ‘ordinary’ members of the public; both provide financial and logistical support for field research projects in Egypt, and each publishes the results of their projects’ work through monographs, a scholarly journal, a colour magazine and online; both encourage the development for early-career Egyptologists through grants and fellowships; and each runs a programme of lectures and other events for members. 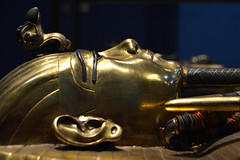 ARCE’s Annual Meeting is a centrally important part of this, bringing together the leading American scholars in the field and a scattering from overseas as well and the Society’s own British Egyptology Congress (BEC) is partly modelled on ARCE’s Annual Meeting. They also differ in various ways of course, perhaps most significantly in that while the Society can no longer rely on the British Government to provide substantial financial support as it used to through the British Academy, ARCE has been very successful, in recent years, in attracting support from the United States Agency for International Development (USAID), mostly to fund the wonderful conservation projects they have undertaken at a variety of sites throughout Egypt. I had wanted to go the Meeting for several reasons. Presenting the results of one’s work in person is a fundamentally important part of scholarly discourse, but this doesn’t just mean standing up in front of an audience and giving a lecture: it is as much about the opportunity to meet friends and colleagues with shared interests, to share thoughts and ideas, and to develop personal relationships. Much of this is best done face to face, over coffee or beer, or by the book stall. As discussed in my first post we have been trying to get away from the old-fashioned, institutional, passive voice, to move towards communicating with a warmer, friendlier voice(s); I believe, as we continue our efforts to raise awareness of the Society and its activities, that it will be equally important to show not only what the EES is and does, but who it is as well. Putting faces to names – and, by association, to institutions, research projects and other activities – is one of the most valuable aspects of events such as the Annual Meeting. I also wanted to see how ARCE handles various activities which are similar to ours, from the running of the meeting itself, to the presentation of its projects. I wanted to see its fundraising operation in full-swing, and of course to meet the people responsible for the work: staff, Governors (the equivalent of our Trustees) and the local chapter representatives who are responsible for providing lectures and other activities in the various regions of the US. Fortunately, I was lucky enough to be invited to dinner the evening before the conference by Robin Young, of the Orange County, California Chapter, who introduced me to several people before the event had even begun – a wonderful start! 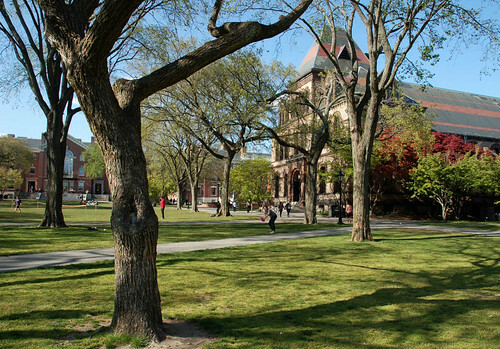 The meeting was held in Providence, Rhode Island and co-sponsored by Brown University whose beautiful campus lies just up (the very steep) College Hill from downtown, just the other side of the State Building from the Renaissance Hotel where the Meeting was held. 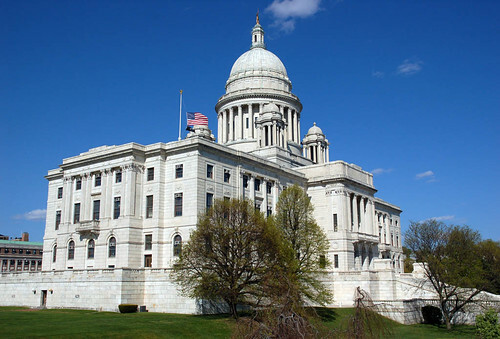 Providence is a relatively small city, easy for a Londoner to get around on foot, and a pleasing mix of historic houses and other buildings around the university, and more modern developments around the river which snakes its way through the centre of the town. This cleverly lit stela of Raneb (or Nebra) grabs the attention at the start of the ‘Dawn of Egyptian Art’ exhibition at the Met. 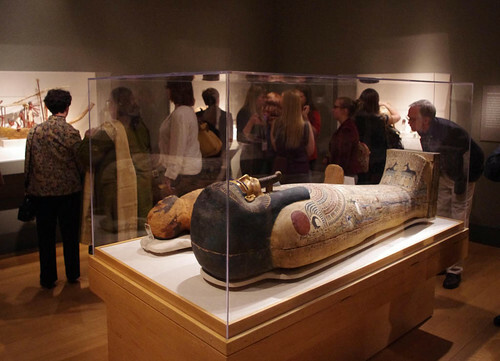 I had decided to combine my trip to providence with a day in New York City, to see the fascinating new ‘Dawn of Egyptian Art’ exhibition, and another to visit the Museum of Fine Arts, Boston whose wonderful collection I had never seen before. 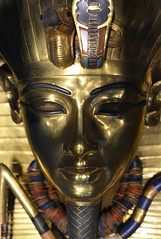 I enjoyed both immensely and was very pleased to see so many EES-excavated objects on display in both places. 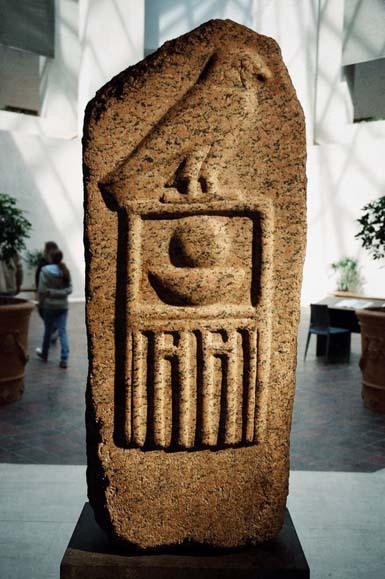 Boston in particular is a very good place to see such pieces as it was the clearing house for the redistribution of objects to the many American museums and other institutions which supported the Society’s excavations in the early days. 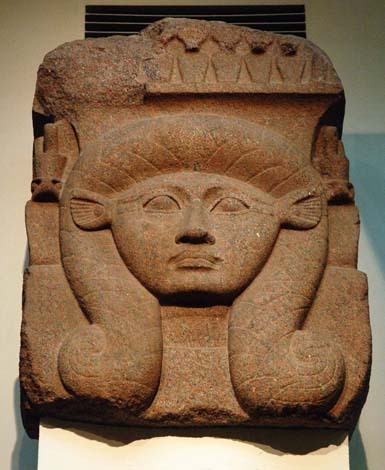 Hathor-headed column capital excavated by Naville on behalf of the EES at Bubastis and now in Boston. See Naville’s photograph taken on site here. 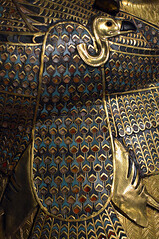 In fact the MFA has one of the finest collections of scientifically excavated objects in the world as, along with the EES objects it also has huge quantities of wonderful objects excavated by G. A. Reisner’s Harvard University – MFA Expedition expeditions to sites such as Giza, El-Bersha and Kerma. 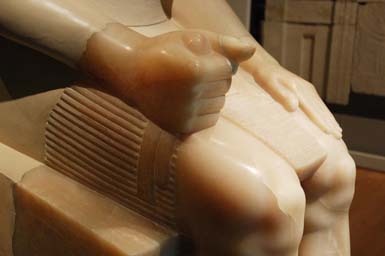 An exquisitely detailed and polished part of a colossal travertine statue of Menkaura in the MFA, Boston. The conference itself was a joy. Egyptology is very much an international discipline: most of us travel regularly and often only see each other at events like this, or in Egypt, as anywhere else. I got to see some old and dear friends, and made a good few new ones too, some of whom I already knew through their work, correspondence we had shared etc. There were, I gather, 350 participants at the conference, including around 120 speakers. The papers were divided across four parallel sessions which made for some difficult decisions, and, as is always inevitable when you have to miss out on at least 75% of the presentations, I had to miss a few that I would very much have liked to have seen, but nonetheless I came away having heard a great many very interesting talks. At risk of causing offence to anyone whose name I don’t now mention, highlights for me included: Catherine Roehrig’s presentation on recent work at Malqata (not least because Catherine’s colleague Peter Lacovara will be discussing the project at the Society’s forthcoming day of lectures on Amenhotep III’s ‘Grand Designs’); Nick Reeves’ marvellous detective work to reunite a series of objects which had come onto the market in Luxor without precise provenance, but which he can now show all belonged to the Overseer of the Builders of Amun, Amenhotep; and Michael Jones of ARCE, whose presentations I always think are wonderfully thoughtful and thought-provoking, on ‘Cultural Heritage Conservation Through Documentation’ which drew attention to some very striking examples of cultural heritage in Egypt which has only recently been lost and – to quote Jones’ closing line – “only exists in documentation.” It struck that this was the reiteration of one the main reasons for the EES’ creation and shows how important and urgent such work still is. 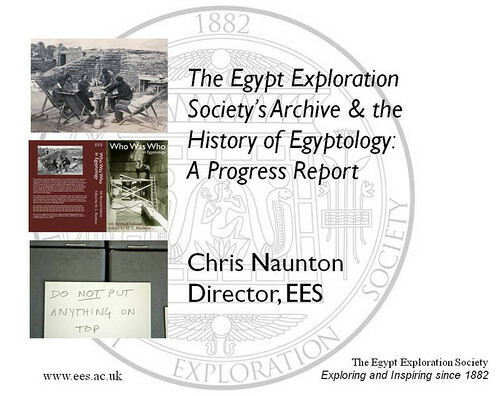 My own paper was entitled ‘The Egypt Exploration Society’s Archive and the History of Egyptology: A Progress Report’ and was intended to be a summary of our archive-related work over the last few years – in particular the Oral History Project, the fourth edition of Who Was Who in Egyptology, and the cataloguing and re-housing of the collections in the Lucy Gura Archive – and the background to it i.e. the withdrawal of the British Academy grants and the serious of changes to the Society’s activities and the way it is run that followed. This was in fact based in part on an introduction I have recently written for the forthcoming edition of Who Was Who which I intend to re-cast post in full here in the coming weeks once the book has gone to press. It seemed to be very well received and several delegates came to talk to me afterwards to say the they had enjoyed it and, following my emphasis on the Society’s now-increased dependence on members’ subscriptions and additional contributions, that they would like to try to support the Society by becoming members. This was very gratifying, and very much in keeping with the rapid disappearance of the leaflets, newsletters and magazines which I had brought for display in the receptions areas around the lecture theatre where delegates gathered to drink coffee. My paper was followed by another on a similar theme, ‘The First 150 Years of Egyptian Collections in Egypt through the Archives of the Milan University’ by Patrizia Piacentini who, with her team in Milan, has built a wonderful archival collection, including thousands of photographs some of which we have been able to incorporate into the new edition of Who Was Who thanks to Patrizia’s generous permission. I was very sorry to have to miss Peter Der Manuelian’s paper entitled ‘Digital Access to the Giza Necropolis: Past Progress, Future Plans’ on the Harvard / MFA Giza archive mentioned above due to it clashing with the session in which I presented my own paper but grateful for the opportunity to chat to Peter on more than one occasion during the weekend. Peter has been doing some wonderful work over many years which appeals to me both for the material itself and for his pioneering use of technology in making so much of it available online. One of the most exciting and gratifying aspects of the conference was that several other papers also drew heavily on EES archival material: Steve Harvey (‘The Stela of Queen Tetisheri Revisited’) and Centenary Award holders Kei Yamamoto (‘Ayrton’s Cemetery F at Abydos: A New Look at an Old Excavation’ – see also here) and Timothy Sandiford (‘A City No Less than Thebes? The Ptolemaic Abydos Settlement Site 2010-2011 and 2011-2012 Excavation Season’) did a great job of making light of some of the Society’s early work at Abydos. In addition, another Centenary Award Project was described by Jennifer Cromwell (‘Unpublished Coptic Documents in Copenhagen’ – see here), and the Society’s involvement in the MSA/ARCE/AERA Mit Rahina Field School was duly acknowledged in papers by Hanan Mahmoud (‘Teaching Archeology at the ARCE/AERA Field School: Memphis 2011’) and Ana Tavares and Mohsen Kamel (‘More from Memphis: Excavations at the Middle Kingdom Settlement in Kom el Fakhry’). The Society was also represented by Jo Rowland who presented the results of her fieldwork at Quesna and elsewhere in Minufiyeh Province (‘Quesna: Its Sacred Use and Position within the Socio-Political Landscape of the Central Nile Delta’), and by the chair, Aidan Dodson (‘The Egyptian Coffins in the Provincial Collections of the United Kingdom (ECPUK) Project’), who is a veteran of the Annual Meeting, and a very well known face on the Egyptological scene in the US. I was very grateful to have Aidan, and his wife, Dyan, on hand to introduce me to colleagues I had not met before, not least a few key ARCE representatives, and to make sure I got invited to the right parties! 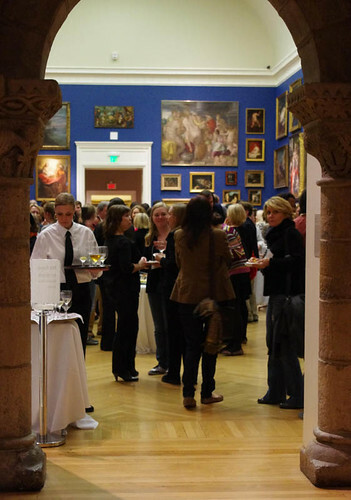 Official receptions were held at the Rhode Island School of Design which has a small but very interesting collection of Egyptian objects, and in the Renaissance Hotel. I was really pleased to get the chance to say hello again to outgoing ARCE President Emily Teeter who has done the Society a great service in recent years by including a number of our images in various exhibitions and catalogues she has organised at the Oriental Museum of the University of Chicago. I was also delighted to meet the newly elected President, Sameh Iskander, whose presentation in ‘2011-2012 New York University Epigraphic and Conservation Expedition to the Temple of Ramesses II at Abydos’ I enjoyed immensely. I was also really pleased to meet and compare notes on working in TV with Kara Cooney, presenter of several series on ancient Egypt for American television, and grateful for the opportunity to hear Carol Redmount speak about the current situation at El-Hibeh, the important site in Middle Egypt which has been extensively looted over several months since the 2011 revolution. I had previously read Prof Redmount’s reports and joined the ‘Save El Hibeh Egypt’ Facebook group which she has established to help spread the word about the situation, and I would urge all readers to do the same if you have not yet done so already! It was very disturbing to see the extent of the irreversible damage already perpetrated at the site but very inspiring to see the lengths that Prof Redmount has gone to try to stop it in the face of inertia on the part of the authorities, and encouraging to discover that the publicity campaign had been started by and enthusiastically supported since by concerned Egyptians. In all, I had a wonderful trip. It was thoroughly worthwhile for all the things I learnt about colleagues’ research, about the audience, and levels of awareness of, and opportunities to promote the Society and its work, and for strengthening connections with old friends and making new acquaintances. I very much hope this won’t be my last Annual Meeting and am already thinking about next year’s event, in Cincinnati! More photos from my trip are here.